The more damaging development has been the role of the mainstream media in the face of the government attempts to muzzle it. 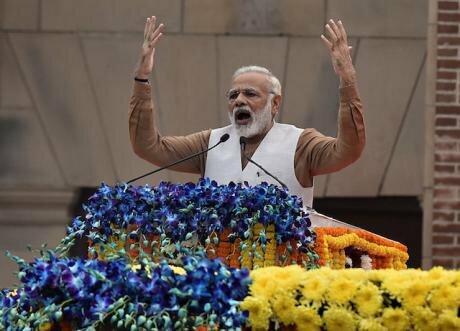 Prime Minister Narendra Modi addresses the crowd on National Unity Day, October 31, 2017. Hindustan Times/ Press Association. All rights reserved. Generally, the death of a judge, in what seem to be mysterious circumstances, while presiding over a case against the second most powerful person in the country, and the closest associate of the head of the government, would be make prime-time television in a democracy. Similarly, the allegations of corruption against the family of the same person would have garnered media attention. But recent events in India prove otherwise. On November 20, and 21, the Indian publication The Caravan broke a story of the death of 48-year old Justice B. H. Loya, involved in the case (of alleged extra-judicial killing) against the president of the Bharatiya Janata Party (BJP), India’s ruling party. This was after a purported attempt to bribe him by the Chief Justice of a High Court, for a favorable verdict in the case, with an amount of Rs. 100 crore ($ 15.3 million). The report contained testimonies of the family of the judge. After a week, while a couple of big media outlets reported on the story (and which contradicted the Caravan report), they seemed to throw up more questions than answers. Any conclusion about the death of the judge, especially when the family has raised serious questions, cannot be derived from media investigations and reports. It can only be settled by a high-level judicial probe which should also consider the bribery allegation. Not only is that not forthcoming, there is no demand for it from the media or the political firmament which is also curiously silent. Almost as a trailer for the judge story, in October, the Indian news website, The Wire, broke the story of how the business turnover of a company owned by Jay Amit Shah increased by 16, 000 times in the year following the election of Prime Minister Narendra Modi. Jay Amit Shah is the son of Amit Shah. The story began trending on twitter and social media. It naturally raised question marks about the fairytale surge in Mr. Shah’s business revenues as well as loans (seemingly, without adequate collateral), the abrupt shutting down of the business (that too just before the controversial demonetization of high-valued Indian currency notes) due to losses in the same year as the galloping revenues, another of Mr. Shah’s businesses involved in stock trading getting a loan from a public-sector undertaking to set up a wind energy plant, etc. Instead of dispelling the cloud hanging over these questions by ordering an inquiry, the Government of India came down with its full might on scotching them. It chose to depute a senior minister to respond, who said: “We reject all allegations against Jay Shah.” Mr. Shah filed a Rs. 100 crore ($ 15.3 million) defamation suit against The Wire. The Indian government also initially gave permission to the Additional Solicitor General of India, the third highest law officer of the government, to represent Mr. Shah. What was curious in all this was that Mr. Jay Shah is a private citizen, and there was clear conflict of interest in the government defending a private citizen, especially, the son of the ruling party president. A court in Ahmedabad, Gujarat, barred The Wire from publishing any more reports on Mr. Shah’s businesses without even hearing the arguments of the news website. Much of Narendra Modi’s legitimacy among the Indian public comes from the perception that, unlike most of the political class, he is personally beyond reproach when it comes to financial corruption. Moreover, it was he who declared a war on corruption, the most emphatic example of which, the government claims, is the demonetization exercise. But Mr. Modi’s silence on the corruption story finally exposed the hollowness of the government’s crusade against corruption, which in any case, has so far amounted to nothing more than targeted attacks against rival politicians. In politics, perceptions play a huge role. This is the first time that Mr. Modi’s carefully crafted image as incorruptible and as a crusader against corruption has taken a considerable beating. WhatsApp messages, tweets and Facebook posts were rife with jokes about Mr. Shah’s businesses, and Mr. Modi’s silence. As examples from history show, when jokes start circulating about a powerful leader, cracks in political legitimacy begin to appear. And in another first, the monthly average of retweets of the Congress party’s prime ministerial contender, Rahul Gandhi’s tweets overtook that of Mr. Modi. But the more damaging development has been the role of the mainstream media in the face of government attempts to muzzle it. Just as in the judge story, there was silence about the corruption story in the media. Even when there was coverage, it was more about the defamation case filed by Mr. Shah rather than the merits of story itself. The rare television channel that has sometimes been critical of the Modi government and faced its wrath for doing so, succumbed, pulling down reportage about the Shah story. This is an extraordinary level of submissiveness displayed by the media. This must also be read in the context of the largest democracy’s abysmal ranking in the World Press Freedom Index. Last year, India ranked 133 out of 18o countries. And this year, it has declined to 136. Recently, the main mode of intimidation against journalists doing investigative stories has been through Strategic Lawsuits against Public Participation (SLAPPs), like the one filed by Mr. Shah. Journalists face severe challenges, including physical violence and threat to life, in carrying out their work. According to an independent media report, there were 54 attacks on journalists (and seven murders) between January 2016 and April 2017, the majority being perpetrated by law-makers and law-enforcers. Four journalists were killed in 2015, and there were 142 attacks in 2014-15. Rohini Singh, who did investigations into the Jay Shah story, recounted the threats she faced while and after doing the story. According to her, this was not the case when she did similar stories on the previous Congress-led regime. So, the emerging “manufacture of consent” in favor of the ruling government does not happen only through active participation, or self-censorship on criticism by the media, but also as a result of the egregious threats that the media personnel face. Jokes making fun of Mr. Modi, or Facebook posts of lay citizens, and films criticizing his government are met with police complaints, legal cases, and threats by the ruling party and its larger ideological family. BJP-led state governments have also introduced draconian bills to curb free speech. India’s democracy is at a critical juncture. After the Emergency declared by the Congress government in 1975 which legally curbed press freedoms, we have not witnessed such levels of abnegation of free speech. (The otherwise-activist Indian judiciary too has maintained a deafening silence on the judge’s death.) It would not be wrong to consider this present conjuncture as marking a deterioration in that regard. While all governments, in varying degrees, try to muzzle free speech or physically intimidate journalists, what is radically different under the Modi dispensation is the wider climate of intolerance fostered by the combustible combination of religion and nationalism aided by state power. This has led to unprecedented attacks against religious minorities on accusations like possessing/eating beef or the killings of those who are critics of the government. Dissent and criticism of government has been construed as an anti-national activity clearly demonstrated by the 40 sedition cases filed in 2016. A film “wrongly” depicting a mythical Hindu queen has caused a nation-wide storm including a death threat to its makers and actors. When the largest democracy in the world, and the oldest one in the Global South, displays authoritarian tendencies betraying the promise of its founding fathers, it has implications beyond India.